Spring’s glorious arrival means it is finally time to step outside and start grilling. There’s no better way to kick off the season than with this hearty grilled chicken salad, made complete with a rustic guacamole mixed with grilled onions and the same garlic dressing you’ll toss with the salad. It’s a dish that’s sure to break you out of the “grilled chicken Caesar” rut. True, this starts with grilled chicken, but it’s chicken that’s redolent of roasted garlic, green chile, cilantro and lime — all of which dances the cumbia with guacamole, crisp romaine and nutty aged cheese. And don’t let rain, cold temperatures or even the lack of a grill spoil the fun. The flavors here are so captivating that a stovetop grill pan will work just fine. Heat the oil in a small skillet over medium. Add the garlic and chiles and cook, stirring frequently, until the garlic is soft and lightly browned, usually 1 to 2 minutes. Pour the oil, garlic and chile into a blender jar or food processor. Add the lime juice, cilantro, black pepper and 1 scant teaspoon salt. Process until smooth. Place the chicken breasts in a bowl and pour one-third of the garlic dressing over them, spreading it evenly over all sides. Pit the avocados and scoop the flesh in with the onion. Add another one-third of the garlic dressing, the coarsely mash everything together with an old-fashioned potato masher, large fork or the back of a big spoon. Taste and season with salt, usually about 1/2 teaspoon. Scoop the sliced romaine into a large bowl. Drizzle on the remaining garlic dressing and toss to combine. Divide among the four dinner plates. Scoop a portion of the guacamole into the center of each plate. 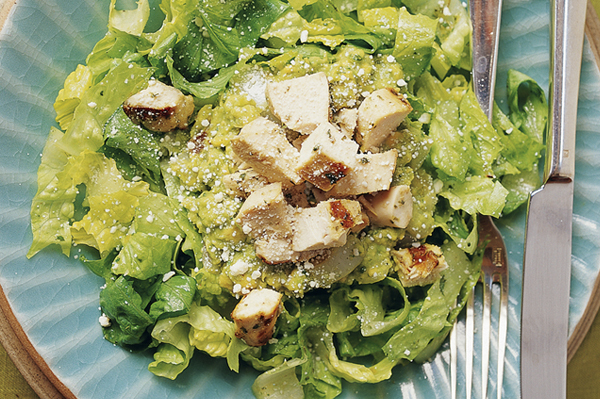 Cut each chicken breast into cubes and arrange over the guacamole. Sprinkle each plate with queso añejo (or its substitute) and you're ready to serve.